Reading and share top 7 famous quotes and sayings about Hesitancy by famous authors and people. Browse top 7 famous quotes and sayings about Hesitancy by most favorite authors. 1. "Yes, I hate orthodox criticism. I don't mean great criticism, like that of Matthew Arnold and others, but the usual small niggling, fussy-mussy criticism, which thinks it can improve people by telling them where they are wrong, and results only in putting them in straitjackets of hesitancy and self-consciousness, and weazening all vision and bravery....I hate it because of all the potentially shining, gentle, gifted people of all ages, that it snuffs out every year. It is a murderer of talent. And because the most modest and sensitive people are the most talented, having the most imagination and sympathy, these are the very first ones to get killed off. It is the brutal egotists that survive." 2. 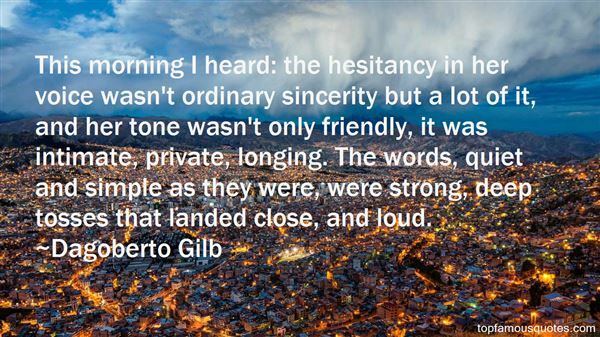 "This morning I heard: the hesitancy in her voice wasn't ordinary sincerity but a lot of it, and her tone wasn't only friendly, it was intimate, private, longing. The words, quiet and simple as they were, were strong, deep tosses that landed close, and loud." 3. "The greatest duty of mankind lies in the proper uprearing of our children. The fact is recognized, but is the duty fulfilled? Do we rear our children as we should? There is but one answer: We fail. Teaching them many things for their good, we yet keep from them ignorantly, foolishly, with a hesitancy and neglect unpardonable—knowledge, the possession of which is essential for their future welfare." 4. 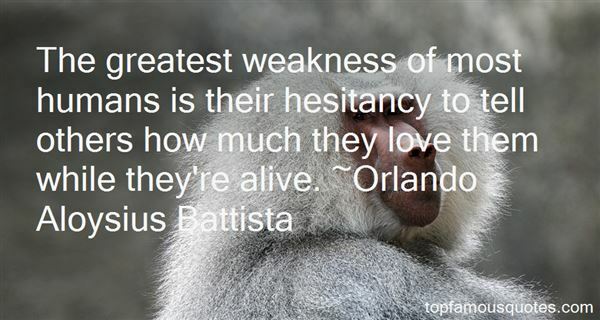 "The greatest weakness of most humans is their hesitancy to tell others how much they love them while they're alive." 5. "He spoke of what he called the "inner history of weakness, of what disappoints us in leaders, the timidity of thought, the hesitancy and the drift." In these cases imagination and will are often blinded by "constructed evils," he wrote. "We falter from childhood amidst shames and fears, we move in closed spaces where stale tradition enervates, we grow hysterical over success and failure, and so by surrounding instinct with terror, we prepare the soul for weakness." 6. "Hesitancy is the surest destroyer of talent. One cannot be timorous and reticent, one must be original and loud. New metaphors, new rhythms, new expressions of emotion can only spring from unhindered gall. Nothing should interfere with that intuition--not the fear of appearing stupid, nor of offending somebody, nor jeopardizing publication, nor being trivial. 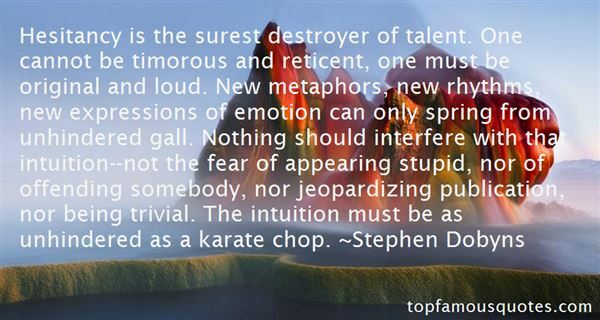 The intuition must be as unhindered as a karate chop." 7. "Until one is committed, there is hesitancy, the chance to draw back, always ineffectiveness. Concerning all acts of initiative (and creation), there is one elementary truth that ignorance of which kills countless ideas and splendid plans: that the moment one definitely commits oneself, then Providence moves too. All sorts of things occur to help one that would never otherwise have occurred. A whole stream of events issues from the decision, raising in one's favor all manner of unforeseen incidents and meetings and material assistance, which no man could have dreamed would have come his way. Whatever you can do, or dream you can do, begin it. Boldness has genius, power, and magic in it. Begin it now." Truthfulness is the foundation of all the virtues of mankind"